Search Engine giant Google has a well known aversion to paying national taxes to the tax regimes of nations in which it operates. In fact Eric Schmidt, the company's executive Chairman and former CEO is on record as having said nations should pay Google for what its adds to the national community. As a former Information Technology consultant who was involved in the very early days of inter - networking technologies I would dispute that, all Google has done works towards handing control of information to government agencies and corporate pirates. Apart from that, Google's main achievement has been in the advancement of sophisticated tax avoidance strategies. Since the risible amounts of corporate tax paid by the national operations of Google and other global corporations, especially those in the internet technology sector such as Facebook, Amazon, Microsoft and Verizon in the world's largest economies has come to light there has been a public backlash against corporate piracy. 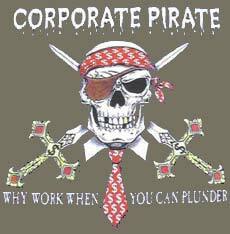 Piracy may seem a strange term to use, conjuring up images of Johnny Depp or Errol Flynn, but the corporate tax avoiders are plundering our national treasuries just as Blackbeard and Captain Kidd used to plunder the shipping routes. Let them be known for what they are. The UK tax authority revealed recently that it had agreed a settlement with Google for the internet search company to pay back-taxes of £130 million (US$186million), despite its British operation racking up profits of US$8.6 billion over past ten years, a tax rate of just 3 percent. Stewart Hosie, deputy leader of the Scottish National Party, commented "there is a palpable sense of skepticism amongst the public, experts and even within the Conservative Party, that the tax settlement reached with Google represents value for the taxpayer". "The truth is that we know very little about the settlement reached between the tax authorities and the company. These discussions have taken place in private, little detail has been revealed by the Treasury and the methodologies employed by HMRC are shrouded in secrecy." While we can understand and support this view from the Sottish nationalists, the line take by the Labour party as the official opposition in the UK parliament, that the Conservative government collaborated to minimise Google's tax liability is a little harder to swallow when we remember that Google paid no corporate taxes at all from 2002 to 2010 when The Labour Party were in power. It has also been revealed that Italy is set to charge Google US$161 million in back-taxes over its US$1.43 billion revenues – equating to 15 percent – five times more than the UK. "The Government must restore public confidence that they have acted in the best interests of the public and have secured a good deal for taxpayers across the UK. They must also answer the charges that the methodology used by the HMRC to calculate future liabilities is opaque, and a potential breach of very clear EU regulations on calculating the tax liabilities of large corporations," Mr. Hosie said. The French are also negotiating a tax deal with Google which could show a different rate of taxation for corporations with links to the US Government, further highlighting the omnishambles of the European Union tax system. One corporate tactic that should be opposed is the very predictable threat to cease operations in nations that require the global corporations to accept local tax laws. And another step in bringing these legal, but unethical, tax avoiders to heel is for 'We The People' to boycott their businesses. There are other search engines, other coffee chains (or better still, if you can find one, use an independent coffee shop, get a better cup of coffee and support local businesses).